Training for a marathon takes dedication, perseverance, time and planning … lots of time and planning. It’s easy to only focus on the physical training and conditioning that you need, but there are a lot of other factors that you have to consider. Forcing yourself outside and just logging the miles isn’t the only way to prepare and sometimes it isn’t even the best option. Using an elliptical for indoor marathon training can give you the variety you need to reach your goals when pesky outside variables try to slow you down! Low Impact Workout – Switching up your workout routine is key; not only for your sanity, but also for your body. Running creates a lot of stress on your joints, especially your knees and hips, which can lead to pain or injury over time. Using an elliptical for low impact workouts can relieve that stress and ensure that you keep up your fitness in your downtime. You Aren’t Dependent on the Weather – Sometimes no matter how pumped you are to get out there and have a great run, Mother Nature has different plans. Sweltering 100+ degree heat and pouring rain can really stop you in your tracks. You can’t control the weather, but using an elliptical to get your workout in means that the weather can’t control you! A Safe Area to Work Out – Where you run is extremely important. We all love a beautiful well-groomed park or trail, unfortunately, it’s just not the reality for many runners. Safety has to be a priority when you are running outdoors, but this can be tough in urban and very rural areas. Worrying about where to stop to rest and constantly being on high alert don’t make for the best mental state when you’re trying to focus on your training. Training Programs and Consoles Provide Motivation – Everybody has those days. Your mind and body are dragging, you have no energy and the thought of a workout just seems impossible. Thanks to interactive technology on your phone, tablet or elliptical, you can light a fire under yourself with the push of a button. With virtual trainers and picturesque routes from around the globe available right on your console, there’s no stopping you! Vary Your Intensity – When you’re training for a marathon it’s really important to make sure you remember the effect your heart rate has on your overall workout. You can’t just run as fast as you can until you drop! 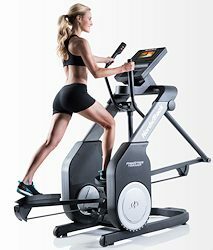 Following the programs on your elliptical’s digital console will ensure that you get your best workout, including warm-up and cool down. Most elliptical models have heart rate monitors on the handles or on a wireless strap, so you can keep track throughout your entire workout. See our recent post for low, medium and high intensity workouts to use while you’re training. 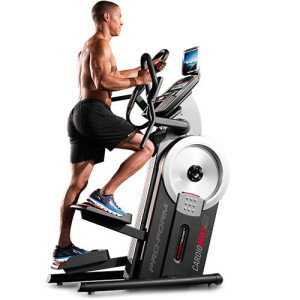 Is It Possible to do Indoor Marathon Training Entirely on an Elliptical? Using an elliptical is great to maintain your hard-earned fitness when you’ve suffered an injury or when an indoor session is a better option. However, you can’t train to run a marathon without actually running. We use the phrase “pound the pavement” when we talk about running, and it really is important to do just that. Your body needs to get used to the impact when your feet are literally pounding the pavement. Without acclimating your body to the impact on your ankles, legs and hips, you are more susceptible to injury. You simply won’t be able to hold up to the strain of 26.2 miles if you haven’t practiced for the real thing. As with most things, the key is to utilize moderation. This is where your elliptical workouts come into play. If your muscles or joints are feeling worn out and can’t handle a day out on the road, you can substitute a day on the elliptical. Keep your heart rate at the optimum level for your scheduled workout and complete the same distance that you had planned. According to a study published by the Journal for Strength and Conditioning Research, an elliptical serves as an alternative to running for cross training purposes. You can get all the benefits of your “easy run” days by hopping on the elliptical. Remember to follow your schedule though, you probably don’t want more than two easy days a week if you’re going to be ready to get out there and do your best on race day. 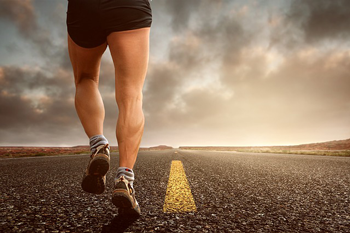 When prepping your body for long distance running, it makes sense to focus on the legs and hips, but the rest of your body has to participate too. 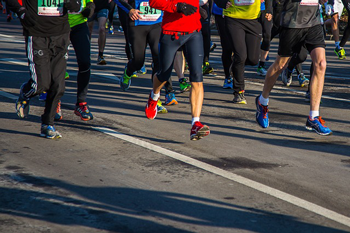 Running a marathon is a full-body commitment and you’ve got to get every part of you involved. Arms – Your elliptical has hand grips that move for a reason! Make sure that you are engaging your arms to push and pull those grips, don’t just use them for balance. Increasing the resistance will have you using your arms, as well as your legs to keep yourself moving. Core – One of the easiest ways to get your core working is to use it for stability. Try taking your hands off the grips while you keep your legs going. This will immediately force your core to engage to keep you balanced. You’ll feel those abs and back muscles working in no time! Thighs – Toning and challenging your thigh muscles is easy to do on an elliptical. Introducing intervals into your workout will get those muscles firing. See this video for an easy thigh-focused technique. Glutes – Increasing the incline on your elliptical is the most effective way to work your glutes. You can do a simple ladder series to get that booty working. Start with the incline at zero and increase it by two levels each minute. Once you get all the way to the top, work your way back down at the same pace. The closer you get to the top the more you’ll feel it! Cardio – The same reasons you do HIIT workouts when you’re out running apply on the elliptical. This will get your heart pumping, give you a great cardio workout and it’s so easy to do. Set the resistance on high and really push yourself for 30 seconds, then let yourself recover for one minute. Repeat for 10-20 minutes. Fat Burning – When you’re trying to burn fat, you want to use as many muscles as possible. Incorporating a variety of the above techniques into your workout will have your whole body working. More work done = more calories burned! Training for a marathon can be a difficult road, but it’s one that you can conquer. With the combination of your running schedule and elliptical workouts, nothing can stop you from crossing that finish line! Are you looking for an elliptical trainer to use in your home? Check out our Best Buy Elliptical reviews for the latest and greatest from the top brands!